Video Poker: What’s in it for you? Life is about getting something for something or “you scratch my back and I’ll scratch yours”, aka quid pro quo. That’s an axiom well-understood in the gaming industry. Here are some tips to keep in mind regarding what’s in it for you when determining the casinos that get your VP (video poker) business. Pay Table Cost: Sure you may want free show tickets, but is that as important as playing games with better pay tables? To put this in better perspective let’s say you choose a casino with 8/5JOB (Jacks or Better) over a casino with 9/6JOB. If you’re just playing quarters at $1.25 per hand and play 800 hands per hour it means you’re running $1,000 an hour through the device. Here’s the math comparing 9/6JOB with 8/5JOB on a quarter machine; if you’re playing dollars multiply each by 4. So now you must ask yourself if the show tickets are worth $22.46 per hour of play. If you’re playing a dollar machine then it’s costing you $89.84 per hour. Relevance: Perks that you can’t or won’t use are irrelevant. For example, if you’re entitled to free rooms but are a local preferring your own bed then don’t even consider that benefit in your evaluation. The same is true of food comps if you don’t like their food. Cash Versus Free Play: Casinos love giving you free play instead of cold cash, but is it really just as good? The obvious answer is, of course not. However, there are still shades of differences in the “free play” offer. Some, for example, limit it to certain devices that more heavily favor the house while others have a time limit before it’s purged. 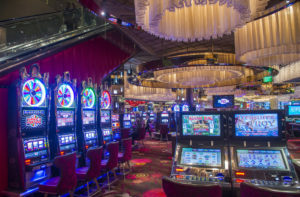 Consider the limitations on free play before selecting a casino. Card Levels: If all other things are equal, you should still narrow your casino choices to one or two rather than spreading the wealth. That’s because most casinos have card levels and the higher the level the greater the perks. In fact, if you’re not a frequent player you’re better off playing at just one local casino than two. Also, my sister and her husband always play on one card at each of two Atlantic City casinos, a good idea. They end up getting free rooms at both Harrah’s and the Borgata as a result. Promos: Recently a local casino had a Viva Las Vegas promotion that drew very few people; that’s because only one winner per hour was drawn. If two casinos offer the same VP games and similar perks then their promotional events can make the difference. Once in a while a casino will have a sign over a group of VP machines excluding it from both card points and promos. I can understand the points but not the drawings. Final Thoughts: Quid pro quo, a given in political circles, is now becoming an expectation in the casino industry as well. As a smart player it’s up to you to analyze the offers and understand the fine print. Also, keep in mind that you’re not married to a casino so if they downgrade their perks you can and should take your business to the house down the road. Author bio: Linda Boyd, a long-time table game player before turning to video poker, writes for “Southern & Midwest Gaming” as well as several other magazine and web-sites. You can hear her insightful interviews are on iTunes. In addition, Boyd’s book, “The Video Poker Edge”, includes free removable pay schedules and her free strategy cards for the most popular games. The latest edition is available from amazon.com, Square One Publishers and book stores. Kindle edition now available.